In the Standard Model (SM) of particle physics, there is no single interaction, no vertex in a Feynman diagram that changes a lepton from one flavour (ie one generation) into a lepton of another flavour. While this suggests lepton flavour is a conserved quantity, lepton flavour has no known symmetry associated with it. And without a symmetry enforcing conservation, lepton flavour violating processes may be possible - and have already been observed for neutral leptons, neutrinos, through neutrino oscillations. This suggests that charged lepton flavour violating (CLFV) processes are also possible - but these have never been observed. Neutrino oscillations can induce CLFV processes, as shown in the figure on the right. However, the rate is determined by (MW/mν)4 and, due to the smallness of the neutrino mass, the expected rate of this μ→eee decay in the SM is unmeasurably tiny: O(10-50). The existence of new Beyond the Standard Model (BSM) physics at higher mass scales can significantly change this picture. Interactions involving extra dimensions or supersymmetric particles (shown on the left) could increase the rate of the μ→eee decay to a more measurable <O(10-20). As the rate of CLFV in the SM is unobservably small, any definitive observation of μ→eee would be a discovery of new physics. The rate of this decay is determined in part by the mass scale of that new physics, and the next generation of CLFV experiments could potentially extend the sensitivity from the scales probed at the LHC (0.5 - 5 TeV), all the way up to 5,000 TeV. These experiments offer a complementary way to search for new physics and to test our understanding of flavour - with possible implications for the unexplained matter/anti-matter asymmetry in the universe. To push the limits on CLFV, UCL has joined the Mu3e experiment at the Paul Scherrer Institut (PSI) near Zurich, Switzerland. By observe more than 1016 muon decays, Mu3e will search for the μ→eee process, and either discover or set new limits on BSM physics. This enormous number of muons is possible as PSI hosts the world's most intense muon beam, producing over 109 muons per second decaying in the Mu3e detector. In order to push the limits on the μ→eee branching fraction to <1016 or to make measurements of signal events, a new muon beam line will also be established. Any possible μ→eee signal is swamped by backgrounds, predominantly accidental coincidences of electron tracks, as well as radiative decay (μ+→e+e-e+νμ>νe). Rejecting these backgrounds requires excellent timing and vertexing capabilities, and momentum resolution. 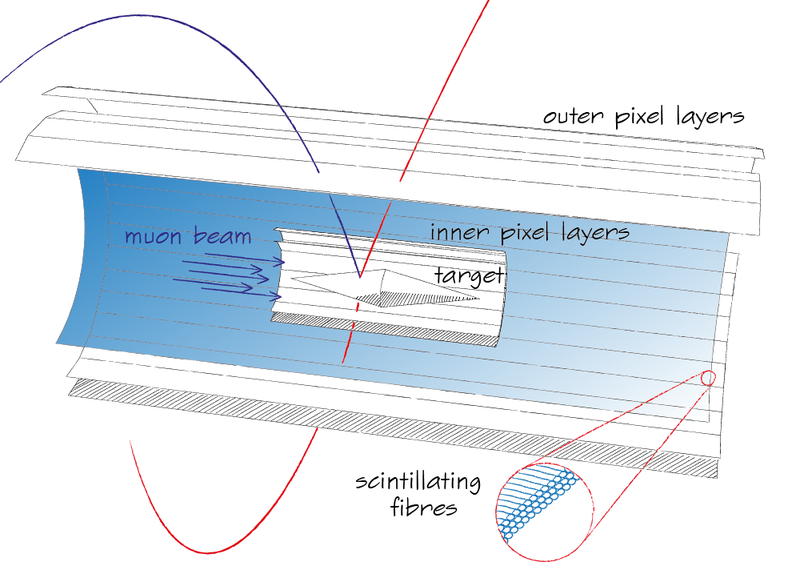 To achieve this, Mu3e uses innovative tracking system built using HV-MAPS silicon pixel sensors, with timing information provided by scintillating fibres between the pixel layers.